Can there be more than one solid phase for a given substance? Yes, solids can adopt different types of microscopic arrangements. If there is a repeating pattern to the atoms in a solid, it is called a crystal. If the ordered structure exists for the entire material, then the phase is known as a single crystal (think of a diamond). If a sample is a bunch of individual crystals, then we refer to the material as polycrystalline. Lots of solids also just have no pattern to the arrangement of their atoms, and this class is known as amorphous. 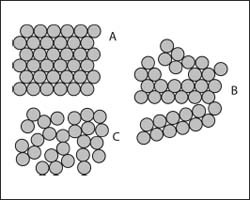 The arangement of atoms in a solid can take several form, depending on the arrangement of the atoms: A) crystalline, B) polycrystalline, or C) amorphous.